Listen here for audio of radio interviews about films from a Christian perspective with Pastors Ted Giese and Todd Wilken on IssuesEtc.org where Christianity meets culture.The audio below covers a discussion of both the winner of the Best Picture of the Year at the Oscars, Birdman, and the 87th Academy Awards in general. Set against a Broadway adaptation of Raymond Carver's "What We Talk About When We Talk About Love" Birdman or (The Unexpected Virtue of Ignorance) is the story of a fading Hollywood actor, Riggan Thomson (Michael Keaton), fighting to remain (or regain) relevance in a world that thinks he's a joke. Earlier in his career people loved him as the super-hero character Birdman, but those days are gone. The film is predominantly about Riggan who is writing, directing, and starring in the Broadway adaptation of Carver's work ashestruggles with depression and psychoses. His psychotic depression rears its head early in the film as viewers see and hear his auditory and visual hallucinations. Due to thehallucinations he believes he can levitate and perform feats of telekinesis, but he keeps all this to himself. He likewise keeps to himself his auditoryhallucinations, the cajoling and antagonistic voice of his alter ego Birdman. In the midst of his personal psychological troubles Riggan juggles tenuous relationships with a girlfriend Laura (Andrea Riseborough), his ex-wife Sylvia (Amy Ryan), and his daughter Sam (Emma Stone) his publicist who had recently been in rehab for drug addictions. Added to this is the introduction of Mike (Edward Norton), a last minute addition to the stage play cast who, following an accident in rehearsal, is brought in to fill a key role in the play before it officially opens on Broadway. Mike, the boyfriend of Lesley (Naomi Watts) another actor in the play, is essentially Riggan's external foil. On one level the film is about Riggan's internal struggle with his ego aggravated by his psychotic depression and his external struggles with ego aggravated by his relationships with his family and fellow actors. While the film is crass and self-indulgent it is also beautiful to watch.Most it is shot giving the illusion of one long continuous scene without many obvious cuts. These long stretches provide viewers with significant stretches of uninterrupted acting. Viewers simply follow the camera from scene to scene. This style provides two things: first, a kind of “god's-eye” view of the unfolding story, and second, an experience that approximates attending a live theatrical performance. Achieving this effect is the work of Emmanuel Lubezki who won the 2014 Oscar for Best Achievement in Cinematography for the film Gravity (2013) and won the same Oscar in 2015 for Birdman. The style draws viewers into both the world of the stage and Riggan’s complicated life. The director of Birdman, Alejandro González Iñárritu, seems to want viewers to set aside the fact that they are watching a movie and wholeheartedly embrace the film’s subject matter. Unfortunately, that subject matter eventually goes to a very dark place as it deals more and more with Riggan's psychoticdepression in what might best be characterized as an unhelpful way. Iñárritu ends up blurring the line between realism and fantasy by strongly suggesting that Riggan's ever-increasing psychotic hallucinations are not really hallucinations. The theme of suicide gradually emerges as the film reaches its conclusion and repeatedly, situations in which suicide is attempted do not end in the central character’s death but rather in his near-escape from death. The first of these near-escapes might well be chalked up to his psychotic hallucinations. The last, fuelled by manic ego, is witnessed by Riggan's daughter Sam and leaves the audience to contemplate Riggan's ultimate fate. This may well serve the story’s investigation of ego, however it doesn't serve the general public as society grapples with the realities of mental illness. Hollywood has a rather long history of using mental illness as a plot device and the Academy has often rewarded many of these film. Some do a serviceable job like Milos Forman's One Flew Over the Cuckoo's Nest (1977) which won five Oscars, and Ron Howard's A Beautiful Mind (2001) which won four Oscars, however this is not always the case. For instance, in 2013 Jennifer Lawrence won the Oscar for Best Performance by an Actress in a Leading Role for the film Silver Linings Playbook (2012) which romanticized her character's borderline personality disorder. In the same category the following year Cate Blanchett won for her much more nuanced and realistic portrayal of a woman with bipolar disorderin Woody Allen's Blue Jasmine (2013). Michael Keaton's performance in Birdman, which garnered him the 2014 Golden Globe for Best Performance by an Actor in a Motion Picture - Comedy or Musical, is truly great, however the end result of the unfolding story is the concerning element of the film. Mental illness is a very serious problem and suicide is likewise very serious. This film is not recommended for individuals sensitive to these health issues it may come across as insensitive and unrealistic. If the film didn't delve so often into a kind of hyper-realism in its storytelling this may not be a big issue. On the other hand, the tension between what is real and what is not provides some of the film's most palpable drama. It is plain that without Riggan's auditory and visualhallucinations the film would become much less flashy. In BirdmanIñárritu does what Hollywood generally does with these stories: he portrays Riggan's mental disorders not chiefly as an illness and health issue but rather as a mysteriously seductive, and dangerously glamorous source of cinematic drama. 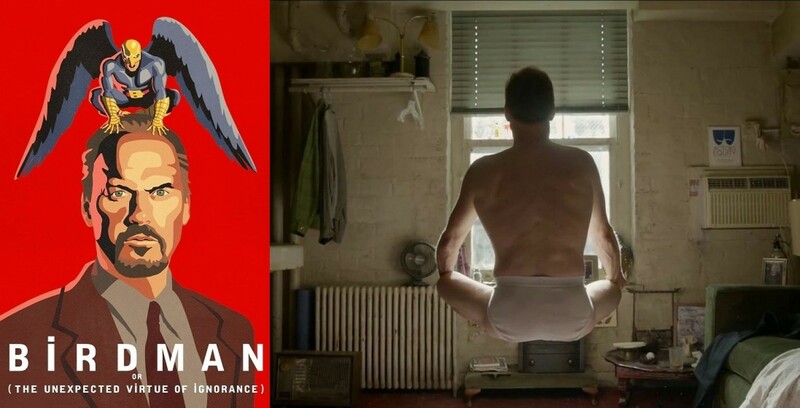 Winning four 2015 Oscars in the categories of Best Achievement in Cinematography, Best Writing Original Screenplay, Best Achievement in Directing, and Best Motion Picture of the Year provides every indication that Birdman is a well-made film, and it is. However, being well made doesn't excuse its glamorization of psychotic depression. As fascinating as Birdman is to watch with its compelling performances, story and visual style, upon further reflection it leaves much to be desired in the area of social commentary. This could sound overly critical however Birdman both invites and repels criticism by providing an internal foil to external criticism in the form of a prop which pops up rather frequently in the film. In Riggan's dressing room is a small piece of paper affixed to the mirror which reads, "A thing is A thing not what is said about A thing." This kind of pretentious quote fits well with Riggan's character, however it should not dissuade viewers from forming a personal opinion about the film. Curiously, the movie vacillates between encouraging viewers to form an opinion and telling them that their opinion doesn't matter, that any opinion is really just the consequence of personal ego. And there it is—ego all over again. Viewers must concede that ego is a problem, not just for the washed up actor Riggan, but for all people because everyone struggles with ego. When the credits roll the audience is left with a kind of calculated mundane betrayal as ego throws mental illness under the bus. Regardless of what Birdman says about ego, it is perfectly okay for viewers to hold an opinion about what this means to people struggling with mental illness and those who support them in their struggle. Christian viewers who find the portrayal of mental illness and suicide in Birdman troubling may well want to meditate on St. Paul's advice from Romans 8 when he says, "I am sure that neither death nor life, nor angels nor rulers, nor things present nor things to come, nor powers, nor height nor depth, nor anything else in all creation, will be able to separate us from the love of God in Christ Jesus our Lord." The Christian baptized and hidden away in Jesus has nothing to fear—not failure or irrelevance or even mental health concerns. They are in Jesus' hands and will not have to rely on the quality of their ego or their personal achievements to gain relevance or acceptance in the eyes of God.